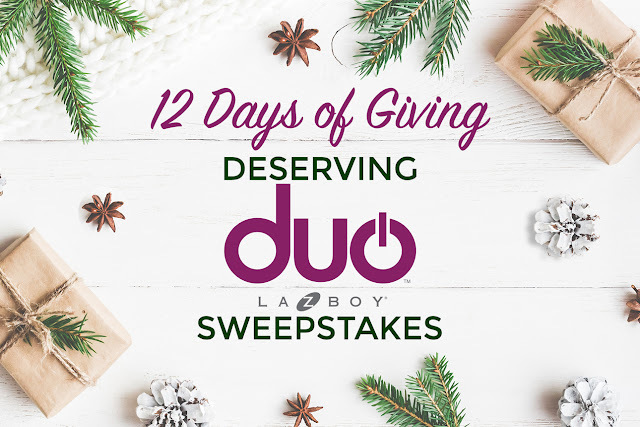 La-Z-Boy Furniture is celebrating the Holiday Season by giving away a new furniture piece each day from their new line duo! Enter to win sofas, loveseats and more! The First Prize Winner(s) and their nominee, if applicable, will each receive: • One McKenna sofa (in D149062 cover only), ARV $1,349.00 USD Maximum Total ARV of First Prize: $2,698.00 USD. The Second Prize Winner(s) and their nominee, if applicable, will each receive: • One Bennet loveseat (in choice of fabric cover grade A through E, no leather cover permitted), ARV $1,579.00 USD Maximum Total ARV of Second Prize: $3,158.00USD. The Third Prize Winner(s) and their nominee, if applicable, will each receive: • $200 Visa gift card Maximum Total ARV of Third Prize: $400 USD. The Fourth Prize Winner(s) and their nominee, if applicable, will each receive: • One Luke two-seat sofa (in C151664 cover only), ARV $1,549.00 USD Maximum Total ARV of Fourth Prize: $3,098.00 USD. The Fifth Prize Winner(s) and their nominee, if applicable, will each receive: • $200 Visa gift card Maximum Total ARV of Third Prize: $400 USD. The Sixth Prize Winner(s) and their nominee, if applicable, will each receive: • One Edie chair and a half (in D149177 cover only), ARV $1,179.00 USD Maximum Total ARV of Sixth Prize: $2,358.00 USD. The Seventh Prize Winner(s) and their nominee, if applicable, will each receive: • One McKenna loveseat (in D149062 cover only), ARV $1,329.00 USD Maximum Total ARV of Seventh Prize: $2,658.00 USD. The Eighth Prize Winner(s) and their nominee, if applicable, will each receive: • One Bennet chair (in FL152379 cover only), ARV $1,699.00 USD Maximum Total ARV of Eighth Prize: $3,398.00 USD. The Ninth Prize Winner(s) and their nominee, if applicable, will each receive: • $200 Visa gift card Maximum Total ARV of Third Prize: $400 USD. The Tenth Prize Winner(s) and their nominee, if applicable, will each receive: • One Luke chair and a half (in C151664 cover only), ARV $1,499.00 USD Maximum Total ARV of Tenth Prize: $2,998.00 USD. The Eleventh Prize Winner(s) and their nominee, if applicable, will each receive: • $200 Visa gift card Maximum Total ARV of Third Prize: $400 USD. The Twelfth Prize Winner(s) and their nominee, if applicable, will each receive: • One Edie sofa (in D149177 cover only), ARV $1,249.00 USD Maximum Total ARV of Twelfth Prize: $2,498.00 USD. Total maximum ARV of all Prizes in this Sweepstakes: $24,464.00 USD. HINT: You can get bonus entries, too. See the official rules for more details. This Sweepstakes ends on 12/06/17 and you can ENTER DAILY to win.